Nuby Non-Spill Training Cup with Handles | Blue | Non-Spill. 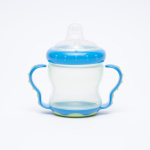 Train your baby by getting this training cup for the smooth transitioning from feeding bottle to this cup. It has a tight lid that prevents spilling of food on the child's clothes and handles to hold it firmly. 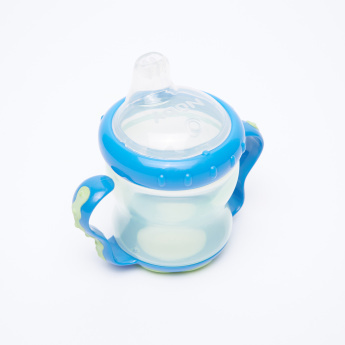 Feature 3 : Soft Silicone spout for your little beginners. 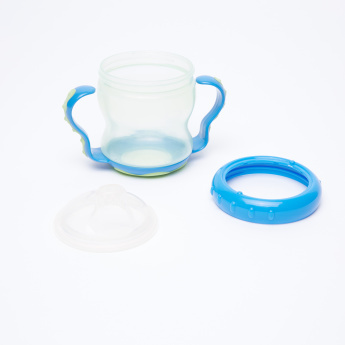 Feature 2 : Perfect for transition from feeding bottle to drinking cup.